The Ortodox Church used a lot of gold leaves and gold mosaics: gold is shining, but it is not the light of the sun or the moon or the stars: it's reflected (divine) Light. And because we are made after His image, we reflecting His Light (Grace): and saints more than common people: that is the meaning of the (gilded) hallow surrounding their heads. After the Great Schism, the rupture between the Roman Catholic Church and the Orthodox Church in 1054, European artist took step by step their own and different direction in sacred art. And from the end of the 16th century onwards, painters will use less and less gold and the hallows of the saints. That didn't mean that artists were not making further use of Light: in paintings, sculptures and architecture; below a few examples over the ages. 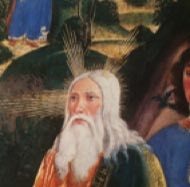 Room VI of the Pinacoteca of the Vatican is closing an era, and before continuing with the 16th century paintings , Iwould like to make a little excursions about the use of gold in the works we have seen until now. In room VII, with the Umbrian School of Perugino, we will see that all gilding is disappearing. 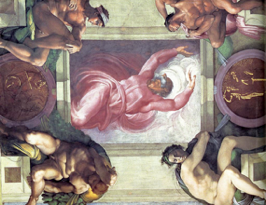 Light got divided from darknes, that was the first day, as we also can see in the creation of Michelangelo. It was only the fourth day that the Lord created the sun and the moon. So, the question is: "What is that light of the first day, if there was no sun or moon?" That light of the first day is "Grace", totally different of the physical light of the 4th day: the sun, the moon and the stars. If staying in the Light (with capital letter), is staying in the Grace of God, darkness, means to be out of grace. 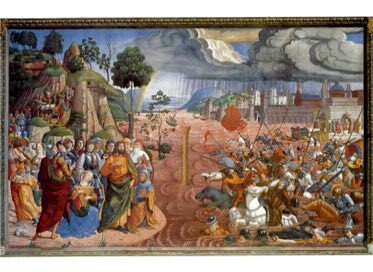 Biagio di Antonio painted this spiritual difference: Moses crossing the Red Sea in the Sistine Chapel: Over the pharao we have dark clouds and stormy weather, over Moses and his people - bestowed with grace - the rainbow and the sun. Light is Grace <-> darkness is out of Grace. 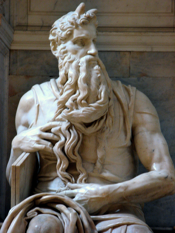 The horns of the Moses of Michelangelo, as we can see above, still puzzles a lot of people, who are seeing the statue for the first time. 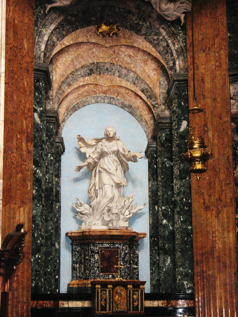 Also, in the lower part of the Colonna of the Immacolate conception in Piazza di Spagna, we see Moses with two horns. Hebrew, as we see in the text above, is a language of only consonants. Only in the 13th century the Masoretes added interpuntion under the letters, giving the language vowels ... and a pratical sense to an idea, expressed in the consonants. The consonants are expressing an idea. Three consonants are usually the root, an idea. Example: the three consonants for the verb "to return" are also used for the verb "to baptise" or "to confess". It is always a return. 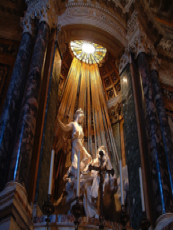 (see my article about the Baptism of Christ in the Sistine Chapel). A return of non-salvation towards salvation. The vowels written beneath/above/aside the consonants are giving the word a practical sense. And just like the rays are emerging from the sun, horns are emerging on an animal. We, humans, are made after His image, and saints are the reflection of God on earth. 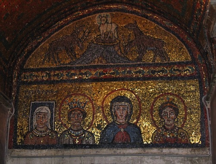 The Chapel of san Zenone (9th century) in the Basilica Santa Prassede shows this in a perfect way: The gold surrounding Mary and the saints and the square blue hallow on the left: it means that that person was still under the living and not yet united 100 % with God, not yet reflecting totally His image. The influence of the Byzantine tradition inspired the use of gold in the artworks of room I-VI of the Pinacoteca: it's showing the divine Light of God = Grace. Having today a Moses with two horns, is actually a historical error in transcription. 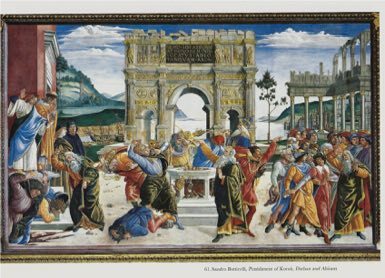 That they were really meaning the Grace/Light of the Lord we see in another work in the Sistine Chapel: the punishment of the Rebels by Botticelli. 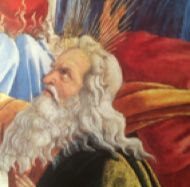 There you can perfectly see the rays above the head of Moses ... and not his "horns". As I described in my article about the Deposition of Caravaggio, this painting is more about resurection than about death. The cornerstone divides the work in two: Jesus points out with his finger the bright part of the stone, and underneath we see in the light the green vegetables. Contrary, in the darkness of the right corner, over the stone, we see dead plants. The whole work is a transition of death to new life (resurrection): from darkness to Light. Looking at the chapel from a distance, we have no clue from where the light is coming, that falls like rays on Saint Theresa, coming over the finger of the angel. It's only when you get very close, that you see the hidden window inside the chapel. The Light here is not the physical light of the sun, it's Grace. The beautiful church on the Piazza Navona, as work of Borromini is a marvel of marble. And full with optical illusions: outside and inside. 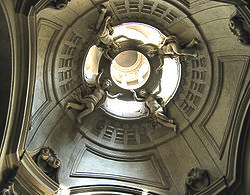 Here, Borromini, just like his rival Bernini, used the same technics for bringing Light on the sculptures of Saint Agnes and on the other side Saint Sebastian. Seeing the two lateral chapels, who are just over one feet deep, bright light is falling on the statues from hidden windows above them. Those saints were able to sustain their martyrdom by the Grace (Light) of God. 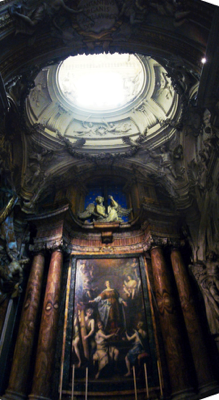 Gherardi took the best of Bernini and Borromini and created in this way the last proper baroque works in Rome. 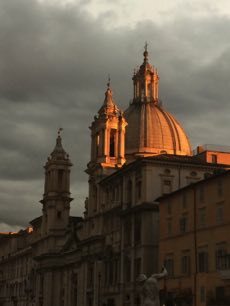 In Santa Maria in Trastevere, the defunt members of the family Avila are looking from their tomb (below) to the dome, where the lantern, holded up by angels descends in the dome. 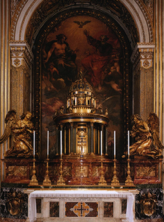 It's an artistic variation upon the Tabernacle of Bernini in the Basilique Saint Peter: there, in heaven, is celebrated the celestial eucharistic banquet. 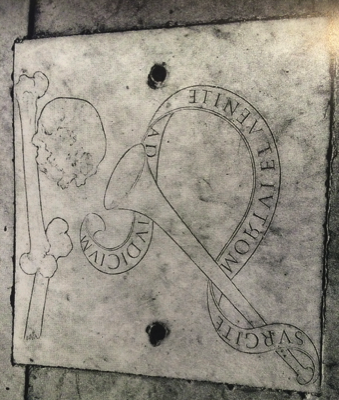 Have a close look at the tombstone: the banderole, twisted around the horn, has the following text: "SURGITE MORTUI ET VENITE AD IUDICIUM"
Only, the words "mortui et venite" written like in a mirror, is not a message for us, the living, but for the defunt members of the family Avila who are buried under the tombstone. Those who are laying in the tomb can only read: "DEAD AND COME"
This stone is a message for the living as well for the dead: The skull is inclined and the horn points directly on the ear of the skull. The defunt members of the family Avila, when the end of time will come, and angels will play their trumpets, will be the first to hear the sound, and having the best places in the celestial eucharistic banquet above them, in the full Light of God's glory. 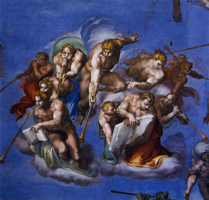 We, instead, are still under the living, and invited to live a christian life, like the defunt members have done: we are called to the resurection (surgite), but our deeds in this life will decide the final outcome: the Last Judgement (ad iudicium). We have still time to repent and to redirect our life towards the Light. If we could read the full text properly, it would say: "DEAD ARISE AND COME TO JUDGEMENT", a message only for the defunt. But in the way the banderole is laying, the members of the family Avila, through their conduct in this life, are already sure of their participation of God's Light (Mortui et venite). At the same time it is also a message for us, the living (Surgite ad iudicium). We have to conduct our lifes towards the Light and the Celestial Banquet. 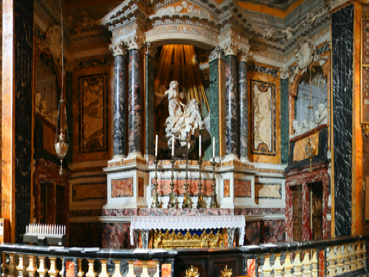 The same dynamic is happening in the Chapel of Santa Cecilia in the Church San Carlo ai Catinari. Underneath the dome of the chapel are buried members of the Pontifical Accademia of Saint Cecilia, the papal choir. Mostly, Saint Cecilia is depicted with a music instrument. Here, she is standing just with open hands. (before the restauring the canvas, she had a music partiture in her hands). But she doesn't need singing: Her beautiful voice can never compete with the divine music she is hearing of the astonnishing beautiful marble angels on the balcony in the full Light of heaven. The chapel itself is quite dark, but we are invited to the wonders of Light in heaven. 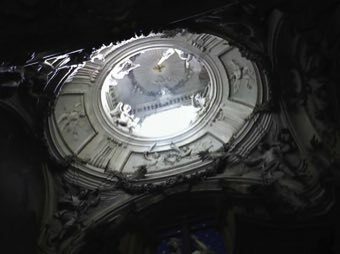 And once again, the members of the Choir of Saint Cecilia, buried just underneath the dome, will be the first to hear the music at the end of time and are invited to join the celestial choir. This is only a very rudimentary selection how artists over the centuries played with light. 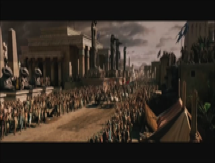 It's amazing how Sir Ridley Scott played with Light and Darkness in his 2014 movie: Exodus, Gods and Kings. Well-worth seeing it ... spectacular !! Theresa was touched by the Grace/Light of God, who allowed her to have that intimate contact with the Divine, her transverberation.